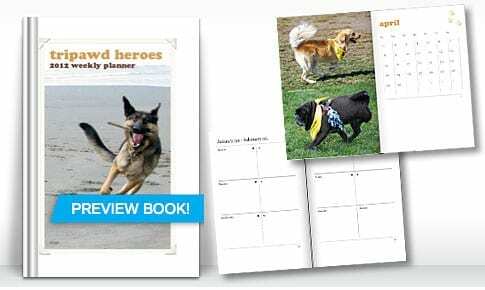 Take advantage of these new Blurb coupon codes* to save on Tripawd Heroes, the 2012 Tripawds Weekly Planners or any custom books you create! 15% off Blurb Bookstore Books! Preview the pages below or see our personalization options for getting copies of tripawd Heroes featuring your dog on the cover! 15% off Blurb Boooks You Create! Create a custom Blurb book to turn your favorite pet photos into a fabulous coffee table book or a unique addition to your bookshelf. Or make your own custom weekly planner featuring your furry friends. A 15% discount is applied toward the product total of one order. Maximum discount is US $150.00, CAD $150.00, or AUD $150.00 off product totals. This offer is good for one-time use and cannot be combined with other promotional codes, site discounts, gift cards, or used for adjustments on previous orders.